Villa Valery is located in the exclusive villa domain Beauvallon between St. Maxime and Grimaud, only 1200 m. from the beach. Superb Provençal style vacation villa for 8 with 4 bedrooms, 4 bathrooms, air conditioning, WiFi internet and heated pool with pool house! 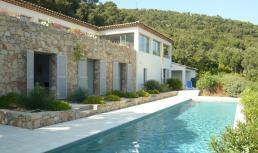 Villa Beauvallon is located just outside St. Maxime, only 500 m. from the sandy beach. Superb vacation villa with 6 bedrooms, 5 bathrooms, private pool and internet on the bay of St. Tropez! Villa Valonne is located in Beauvallon between St. Maxime and St. Tropez, only 500 m. from the beach. Superb vacation villa with 6 bedrooms, 6 bathrooms, private pool, internet and breathtaking view of the bay of St. Tropez! Villa Bartole is situated in the prestigious domain Beauvallon Bartole, between St. Maxime and St. Tropez. Superb vacation villa for 8 with air conditioning, internet, large private pool and breathtaking sea view!